(15dec01) This issue will present thoughts about my personal messin' with motors in 2001. Next issue, 1jan02, will talk about outfitting my AF4. The Guru idles along in his AF4. I've had an interesting year of messing with motors in 2001. I took the AF4 out almost 50 times this year and have six usuable motors in the shed at last count. I made the acquaintance of a guru who has been teaching me the ins and outs of old motors. He wrote an essay about getting old outboard motors for Duckworks Magazine. You should click over to it and read his advice. I'll go through my experiences one motor at a time. I got this motor about 15 years ago for $50, the man was about to throw it in a dumpster. He had used it in salt water and put it away wet. Parts were corroded and it would not turn over. It sat in my shed that way for about eight years before I tried to resurrect it for use on my Birdwatcher. This motor was made by Clinton about 1970 and the original manual and parts list were with it. It has an air cooled power head with a water cooled exhaust system, remote fuel tank. Direct drive. A strange carb where the needle valves don't open up passages to admit more fuel, but instead open holes to let air into the fuel system (?). 37 pounds. It took a while to get past the corroded screws that held the cover on the engine but once done it was clear there was nothing seriously wrong with the engine - the corroded recoil starter was keeping it locked up. When that was removed the engine turned over with a satisfying "thunk - thunk". I rebuilt the starter as best I could using a guitar string to make new pawl springs. But there was no spark. I showed it to the local lawnmower guy, which is probably a better approach than showing a motor like this to an modern outboard mechanic. He took one look at the points and said they were identical to Tecumseh points and sold me a set plus a new spark plug for less than $5 as I recall. Once installed it sparked with a snap and I was able to start it and began using it. That was maybe five years ago. I've had a lot of trouble with it shearing flywheel keys, an event which will ends a boating day! The guru has infomed me that the key on the flywheel is just for alignment, just for looks almost. The real attachment is by friction on the tapered shaft provided by lots of torque on the flywheel nut. We never have a torque wrench around when needed and here is how he torques the nut: get the flywheel nut good and tight with a wrench then hit the end of the wrench soundly with a hammer a few times to sock it down. Seems to work! At a meeting of the Antique Outboard Motor Club someone was junking a similar Clinton outboard and I grabbed it. The powerhead was shot but I was able to use its good recoil starter and flywheel (the sheared keys had damaged the keyway on the original wheel) and I'm keeping that old carcass around for its carb, fuel pump, prop and lower unit. So the Sea King 3.5 lives again. The only problem I face now with it is its odd quick release fuel hose. The O ring in it is shot and I haven't found a real replacement for it. I need to find a place called "O Rings R Us". Engines like this are the guru's bread and butter. A great motor made in numbers such that new replacement parts are still being made. 77 pounds. If you add the six gallon tank full of fuel you are looking at about 120 pounds total. This one wouldn't run more than a minute when I got it for $75 three years ago. It looked like it had just been rebuilt and repainted. The float in the carb was not set properly, indeed it wasn't the right float. But I got it to run well after trial and error bending of the float bracket. Starts well, lots of power, smooth and fairly quiet. I'm sure it was state of the art in its day. It became my AF4's main engine for two years. Two problems with it. It has always burned 1.5 gph at all throttle settings, so you don't want to poke around with it. The guru has an identical engine that burns about 1 gph at part throttle and he is sure something is wrong with mine. I've rebuilt the carb and installed the proper float with no change. By the way, the guru showed me some tests of modern 10 horse 2 cycles and the old ones stack up surprisingly well against them. The new ones burn about 1 to 1.5 gph like the guru's old engine. I doubt if the new ones have more power although I see that they operate at about 5000 rpm vs 4000 for the old engines. The old engines have plain metal bearings and I assume the new ones have needle or roller or ball bearings. The guru says the old ones are MUCH easier to work on and I've noticed no special tools are needed for the old ones. The new motors might be quieter and neater. I think this one is an Eska which is sort of a Tecumseh air cooled two cycle power head on a clone of the Clinton lower unit. Has a built in tank, about 1/2 gallon, plus a fuel pump for a remote tank. About 1970 we think. Direct drive. Got it for $40. 37 pounds. This is an interesting engine in its own way. Very hard to start until I read that the needle needs setting at 1 turn (the needle is hidden under the engine). Then it starts reliably cold with full choke if you pull it about ten times, one or two pulls when warm. The guru has better luck starting and I noticed he was always reaching into these engines to tickle them in the just the right spot for a quick start. Turns out he richens the main needle a bit - 1/8 or 1/4 turn, and then returns it to original when the engine is warm. I wondered how he knew to do that until I saw his collection of real oldies where that starting treatment was standard with written instructions right on the cowling. Once started this Sears 5 may have sputter spells and if you try to retune for smooth running you will get it all loused up. So now I let is sputter until it smooths out on its own. This engine is noisy and shakes. I think the noise is especially annoying since it sounds like the lawnmower that it is, constantly reminding me that I should be home mowing the grass instead of being on the lake. 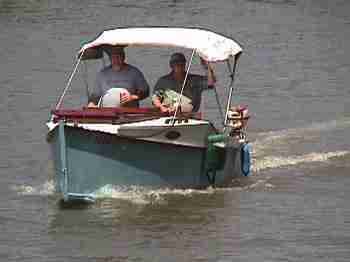 From time to time I get letters from folks who want to adapt a lawnmower engine to a boat. I say Eska (and Clinton and Elgin and Lauson) did that a long time ago. This engine puts out lots of power and pushes my AF4, at maybe 700 pounds total, about 5 mph if I sit in the stern or 6 mph if I use a 4' tiller extension, this with the throttle set at 2/3rds. The tiller extension is that important on AF4 for any engine. It also makes the motors seem that much quieter and finer to steer. And the Sears 5 burns only about 1/3 gallon an hour at cruise throttle of about 2/3 rds. The most economical engine I have. Amazing and the Sears 7.5 (40 pounds) that I used to have, another Eska, also had its share of power and noise and fuel economy. Interesting engines. Two problems with the Sears 5. One was a leaky drain in the carb bowl. (I'm guessing the idea was to drain the carb bowl before putting the motor in the car trunk.) The old O ring seal was shot so I epoxied the drain shut. Next it lost its water pump impeller at the end of the season. One of the problems with off brand motors (Clinton and Eska no longer make motors) is getting impellers. 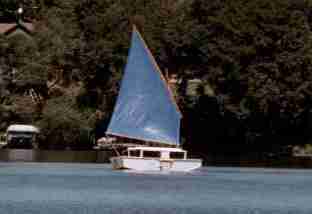 The guru said the older Clintons and Eska didn't have impellers! They just had water tubes that ran to brackets behind the prop and cooled the exhaust by "head" pressure when at speed, that pressure lifting the water up to the level of the motor head. He showed me where the bracket was on the Sears 5. So I've completely removed the pump and housing and rigged up a tube from behind the prop to the original water tube that went into the top of the water pump, joining the two tubes with a slip fit piece of heavy rubber fuel line. Above half throttle the water outlet puts out a full stream just as it did with a fresh impeller! Actually the guru has some big 20+ hp water cooled motors that are cooled this way! This is a delux engine from about 1960. Very quite and smooth with full gear shift. A lot heavier than the Sears 5, at 57 pounds. Physically it is large, about the same size as a modern 15 although I'll bet it is a lot lighter. I traded an armful of boat drawings for it. I haven't gotten this engine to run well with consistancy. Sometimes it is faster than the Sears 5 but usually it is not. I thought it might be suffering from air leaks in its fuel system which is a modern vacuum system (my Johnson 10 uses a special pressure tank). Next year I may change out the fuel lines and see what happens. Burns about .6 gph as I recall, almost twice the consumption of the Sears 5 at the same speed. One weekend this past summer I took this motor on AF4 for a two day cruise of Lake Sanchrist which is a nice big conservation lake south of Springfield, Illinois. After about three hours of running it threw a rod! The guru was cruising in his boat and after camping out on the water on Saturday night he towed me to the ramp, carried the engine up to the pickup truck and took it all apart on the tailgate in 20 minutes or so. He says you can only do that with a motor with plain bearings as with this old one. The main cap of the connecting rod had broken, one of its cap screws laying loose undamaged in the crankcase. The other screw was loose but we could see that neither screw had been safetied properly (with little bendable tabs that go under the screw heads). Luckily there was no damage beyond that and a few weeks later the guru scrounged up another connecting rod and reassembled the motor in an hour or so. So it's all back together and running again. I still think this motor is the best one for small lakes with AF4 because of its quietness and ease of use. We'll see if I can get the power to be consistant and hope it will hang together now. The guru found this one in a pile of old motors behind a dealer. (OK, here is the story behind it. 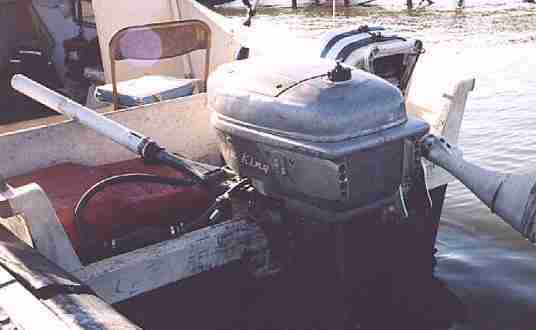 He got a damaged modern Yamaha outboard in an auction for $20.26. He found it would take hundreds to fix it and decided against it. He sold the prop for $20. He took the Yamaha carcass to the dealer and traded for the Sea King in the dealer's junk pile. So the the guru had 26 cents in the Sea King.) Built around 1956. Full gear shift and internal fuel tank of about 1.5 gallons. This motor was made by OMC for sale by Montgomery Ward's under the Sea King name. The guru tells me it is essentially a Johnson 15 with slightly smaller bore, plain bearings and simpler vibration isolation and sound deadening. The cowling is a work of metal art but is hard, with eight screws, to remove to work on the engine, where the Johnson 10 from the same year has two simple latches. 76 pounds. Here is a photo of it. Note the rocket exhausts. The white motor beside it is the Sears 5. It started up the first time I tried it in a test tank! But out at the lake on its first run it was all vibration and no speed. The guru tried it and said it was running on one cylinder. Off came the cowling, starter and flywheel until we could see the ignition parts. The coils were the originals and were cracked and turning to dust. The guru installed good used coils from a junker Johnson and new points. We also found the motor had a pad on its transfer port for a modern fuel pump, something the Johnsons from the same era did not have since they were still using pressure tanks. We mounted a good used fuel pump. It purred in the test tank. Out on the lake it was unhappy and after about ten minutes ran very rough and quit, spewing fuel out the overflow vent of the carb. Back to the shop with it. The next time the guru stopped by he had a carb from another 12 with a fresh rebuilt kit (he has a huge collection of old parts). Since then the 12 has always started and run well with the one problem - we can't get full power for more than five seconds or so before the RPM's start to sag. Then I can reduce throttle, lean it out until the rev's first go back up and then fade, then richen it to the original setting, and then return to happy motoring. It will run nicely at about 90% but not at 100%. So I've been using it that way. Tried different fuel tanks, lines and pumps and connectors. No difference. Starving for fuel?? Maybe, but remember the first try with the original carb? Further searching showed that carb has a much larger hole in its float valve, no doubt to deal with the small fuel pressure delivered by the internal fuel tank. I'm thinking our first try with using the fuel pump with that carb failed because too much fuel was getting into the carb through that large hole, flooding out the carb. Maybe we'll figure it out next year. In the mean time the Sea King 12 is the preferred motor for the AF4, having at least as much power as the Johnson 10 while using less fuel, and still has full shift. This one was given to me. Quite light for a water cooled motor at only 38 pounds. Too ugly to show on the internet. The steering was rusted to the point where it wouldn't steer or tilt. Simultaneous applications of heat, oil and hammer got it loose and working. The spark plug hole was stripped over about 2/3rd's of its length but there was enough good thread to seal the plug. No spark. Removed the flywheel, scraped and reset the points. Now it sparked. Internal fuel tank, about 1/2 gallon, rusted to the point of leaking in lots of places. Cleaned out as much rust as possible. Covered the leak spots with JB Weld and added big fuel filter. No recoil starter but unlike the air cooled Clinton and Tecumseh this one has a pulley groove on the top of its flywheel. Cleaned out carb which has no throttle control as control arm is broken off. About this point the guru stopped by and said the Wizard was really a Scott Atwater from about 1960, adding that Scott had by that time been bought out by McCulloch. I had though the engine was a lot older than that. The Wizard started and ran nicely in the test tank, usually on the third tug and not very sensative to mixture setting. I wired the throttle wide open and used the choke, which has a very nice three position detent, as a throttle. (In normal life the carb is linked to the magneto.) Took it out to the lake and was quite happy with it. Quieter than the Sears but only slightly slower. Burns about .5 gallons an hour. Actually about the same speed as the Johnson 5.5 normally runs but noisier. The guru seemed amazed that it ran at all. He gave me some repair manual copies. From that I learned that mine was also missing its low speed needle, the threaded hole being wide open. He asked me if I'd want a Scott 5 that he was throwing out. I went over for a look. It had a loose con rod and I said I wasn't interested. I noted that the lower unit looked exactly like that on my 3.6 except his had full shift. He didn't think they would swap but later I saw in his repair manual that some 3.6's had the full shift lower unit. I saved that motor from the dumpster and found the lower units did indeed swap perfectly. So now I had a lightweight 3.6 with full shift for nothing. Well almost. The guru warned me to change the cooling impeller if I was going to use the motor for real. The new impeller, about the size of a doughnut hole, cost $40. And that is why Scott Atwaters are given away for free. A word about fuel consumption. If you throttle back even with a new two cycle motor, you often won't get a reduction in fuel consumption that matches the resulting loss in speed. Your may get a LOSS in mpg. My Johnson 10 is really bad at this since it burns 1.5 gph at all throttle settings. So at 15 mph it gets 10 mpg and at 5 mph it gets 3.3 mpg! The Wards 12 is a bit better since it gets about 1 gph throttled down to 8 mph. The Wards 3.5 and Wizard 3.6 both burn about .5 gph at maybe 6 mph for about 12 mpg. The Sears 5 is the king at about .3 gph at 6 mph for about 18 mpg. By what I've been seeing in my testing, a two cycle motor is unhappy at lower speeds, it likes running at about 2/3rds throttle. And in general you get about the same mpg at all speeds with a given motor. No need to slow down to save fuel. Testing (by individuals and not company testing) I've seen done on modern two cycles gave similar results. They say part throttle operation is where four cycle motors really pay off. I'll show how my AF4 is currently outfitted. 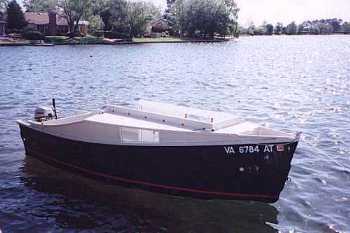 AF4 is a simple low powered cuddy cruiser intended for protected waters. Kilburn Adams of St. Louis brought a boat similar in spirit to AF4 to our Midwest Messabouts and it was easy to see what a good idea this is. 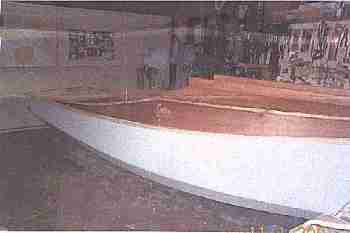 Kiburn's boat was a modified Sturdee Amesbury power dory with a small cuddy added and a new 4 stroke Yamaha 10. He thought the empty boat weighed about 600 pounds ready to go. 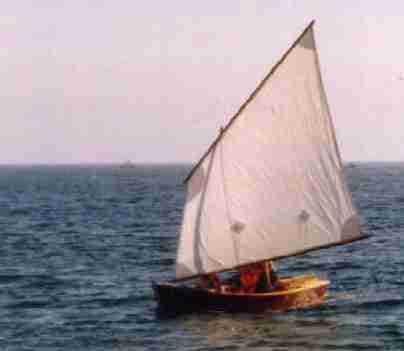 It planed quite well with two men on board at about 13 knots. He made a 60 mile trip on the Mississippi (above the Alton dam where the current is small) burning about 4 gallons of fuel. It's quiet and cheap to operate. It's a good idea now that smaller 4 stroke motors are more common. Here is an AF4 by Barry Targan. I think he is using a new 8 hp 4 cycle. AF4 is supposed to do about the same job. 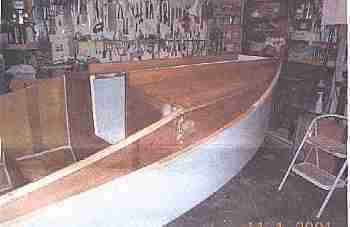 Its simple hull shape won't handle rough going like the dory, but it's very easy to build and roomier. 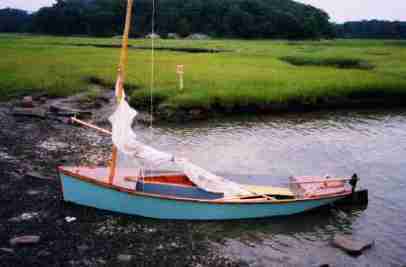 This boat has an open bow well for anchors and junk. The cabin is 8' long and 3' deep and 4' wide for minimal camping. It should be comfy for one and snug for two. 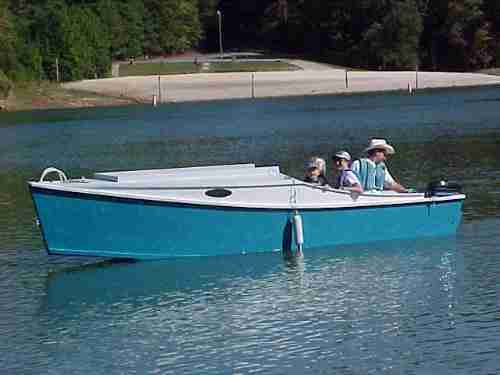 it has a slot top to allow stand up boating in good weather. You cover it with a snap on fabric piece in the rain and cold. 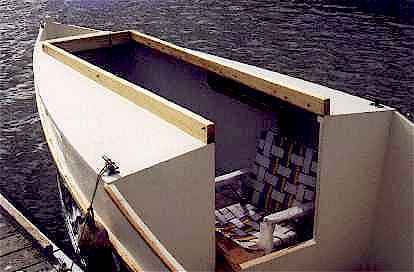 The cockpit is a full 6' long and 4' wide and totally open. You could lounge there too with a folding chaise. Aft of the cockpit is a draining motor well which will take the standard 6 gallon fuel tank and then some. Here is John Bell & co. in his AF4. AF4 uses the simplest nail and glue construction. It takes five sheets of 1/4" plywood and four sheets of 1/2" plywood. 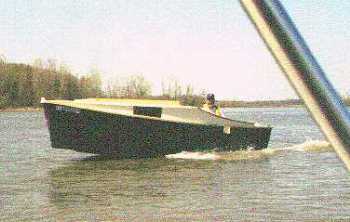 There is also a shorter 15' version called AF4Breve, the prototype shown here built by Bruce Given. Plans for either AF4 or AF4Breve are $30.